Despite the never. ending. desire. to. stop. at. every. single. sight. of. any. interest. whatsoever., after the exploration of Lindsborg, Kansas there was nothing left to do but drive towards Sidney, Nebraska. From Salina, Kansas to the Colorado line where I turn north is just a bit shy of 300 miles which I know has to be driven all in one sitting, else I’ll not make it to Sidney for the night. 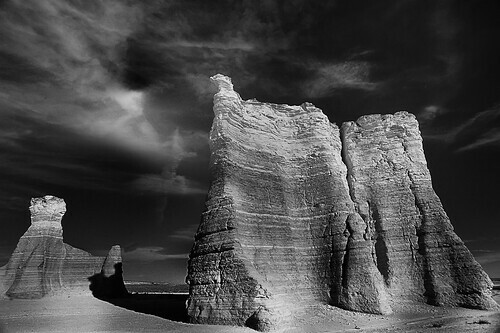 This knowledge does not preclude the strong temptation to take a minor detour at highway 83 south of Colby, Kansas to revisit Monument Rocks. I resist assisted by the vision of what I captured there on my last pass through the area on my Tour of the West last October. The next morning in Sidney, Nebraska my plan for the next two days is formulated: make Badlands National Park, scout the area, capture a sunset, arise early the next day for a sunrise, then head to North Dakota. From here to Buffalo Gap, South Dakota is about 3 hours, which will leave me more than sufficient time to find a great spot in the Park for the sunset shoot, given the fact it’s 7:00 a.m. and I’m already wheels up. Passing the turn-off to ScottsBluff I again resist the urge to veer. Rather than see it with my own eyes once again, I pacify myself with this capture also from the Old West trip. It’s okay. You can admit you had NO idea Kansas and Nebraska held such topographic wonders. I didn’t either. On these trips the human condition, its vulnerabilities and the multitude of cracks in its infrastructure become painfully apparent. I over-generalize. It’s MY human condition that rises so painfully to the surface. A small sign off highway 385 near Alliance, Nebraska calls my name – something about Car Henge. At the mercy of my hedonistic road trip tendencies, I’m off on a chase – a sucker for the weirdness of the American back road experience. Carhenge which replicates Stonehenge, consists of the circle of cars, 3 standing trilithons within the circle, the heel stone, slaughter stone, and 2 station stones, and the Aubrey circle, named after Sir John Aubrey who first recognized the earthworks and great stones as a prehistoric temple in 1648. The artist of this unique car sculpture, Jim Reinders, experimented with unusual and interesting artistic creations throughout his life. His desire to copy Stonehenge in physical size and placement came to fruition in the summer of 1987 with the help of family. Thirty-eight automobiles were placed to assume the same proportions as Stonehenge with the circle measuring approximately 96 feet in diameter. The honor of depicting the heel stone goes to a 1962 Caddy. WAIT!!!! It gets even MORE Fun! I'm not sure what statement this is supposed to make, but it was entertainment at its finest. The Badlands and Pine Ridge Indian Reservation, NEXT…. thanks once again for the astounding photographs and fun stories from the road West – I can’t get enough! I’m currently reading Mark Twain’s ROUGHING IT which you may have read, about his travels through the West in the mid/late 1800s. Anyway, keep it up: you have definitely inspired me to follow my creative muse SOON and SRT-it. Carhenge! Oh my, oh my! Tammie, as usual, haunting and beautiful photographs coupled with evocative prose! Carhenge! What a site. Wonder what folks will thing 500 years from now. Would love to be there to hear their explaination. Your photography captures it beautifully. Keep up the great work. Can’t wait for the next installment. Wow, another amazing time… I loved the Carhenge, that’s simply amazing, really really creative and beautiful! And all the drives, plans of time and pictures seem so poetic for me, it’s just a dream, congratulations! Well, it is hard to explain, but I am sure you would like, if you want I can send an email explaining! I would love to! Have a nice week, keep updating us! Amazing!!! 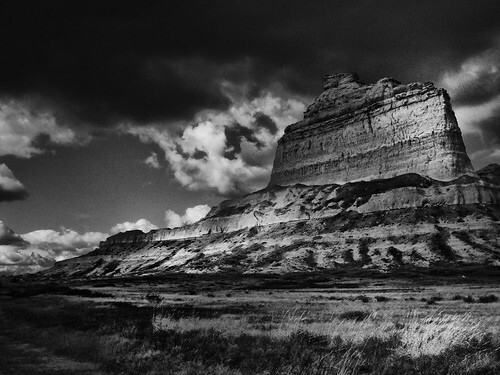 I swear your B&W rivals Ansel’s work….WOW!! The sights we’d never see if not for your camera and thee!!! What fun those off road treks of yours! The fish head is a scream. Keep it coming our way….pure enjoyment for us!